Wishing a great weekend to everyone out there today! It’s been a crazy week for us East coasters, what with another two foot snow dump this past Tuesday. Two feet of white stuff is a bit much, and thankfully it wasn’t heavy like last week’s batch. (So say the shovelers at my house.) We already had snow on the ground, so our mailbox is now completely encased in white. I think every mail delivery worker up here should get a big fat bonus check during arctic stretches like this. It can’t be easy. 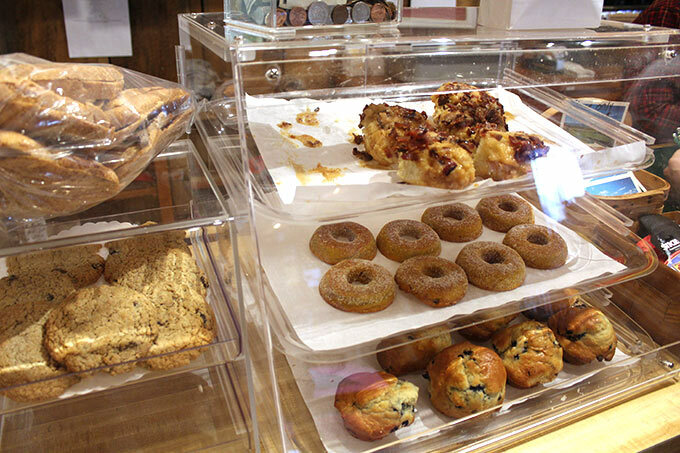 I spy candied maple bacon biscuits. And fresh cider donuts. Eek!!! 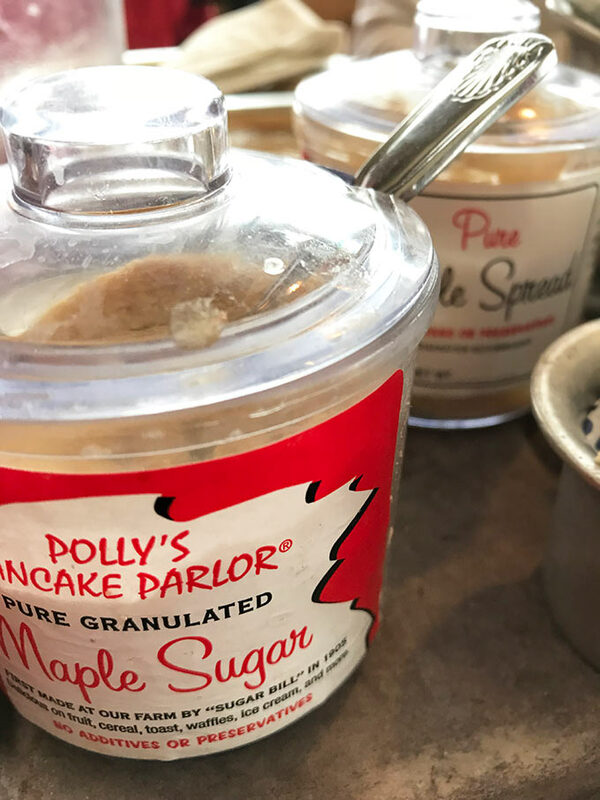 A few weekends ago, in the midst of our kitchen renovations (think no stovetop, oven and kitchen sink for weeks) we escaped the indoor kitchen camping scene for a delicious homemade breakfast up in Sugar Hill, NH at Polly’s Pancake Parlor. 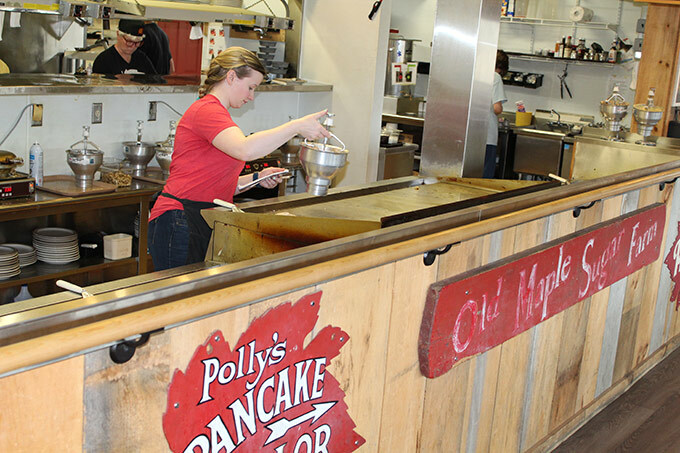 You’ll find all things maple at Polly’s Pancakes. Jon and I first discovered Polly’s by accident last fall when we sneaked off on a quick weekend getaway to Sugar Hill and Jackson, NH. 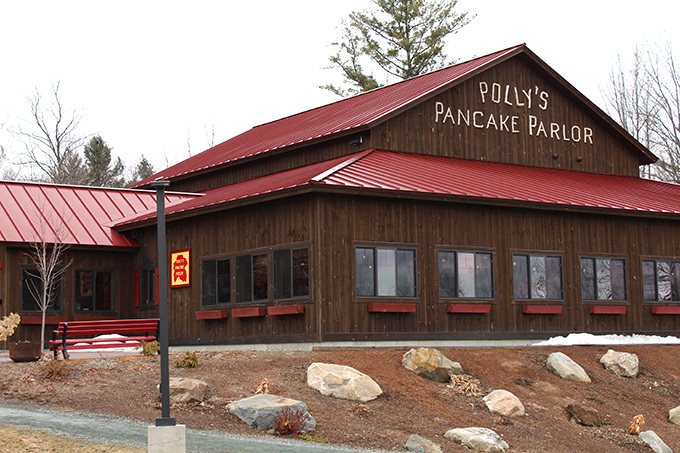 We visited the Garnet Hill outlet in Franconia then googled for a bite to eat and Polly’s Pancake Parlor came up first. Lucky us, what a great find! Real maple syrup. Real maple sugar. 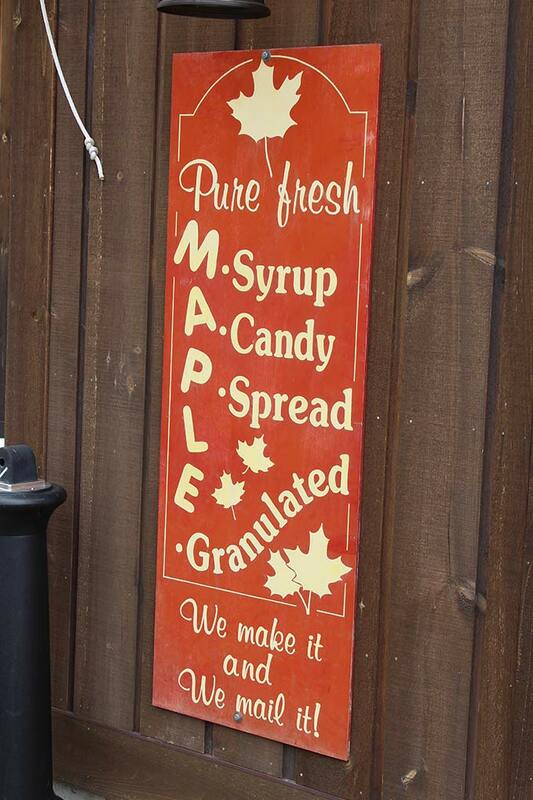 Real maple spread. My kind of heaven on earth. 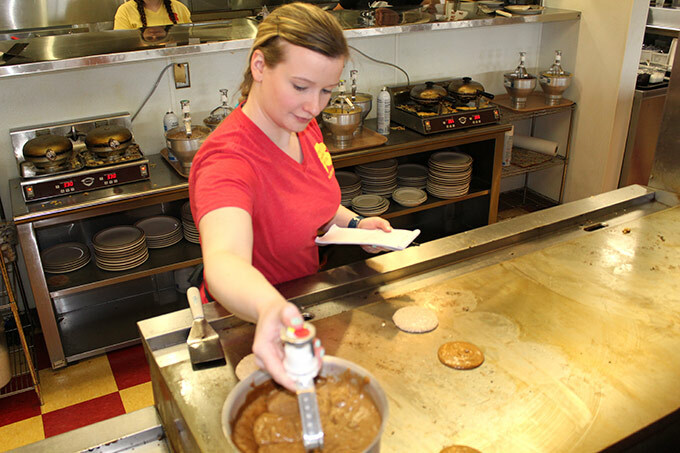 Polly’s Pancake Parlor has been around for over seventy-five years now and I know why. 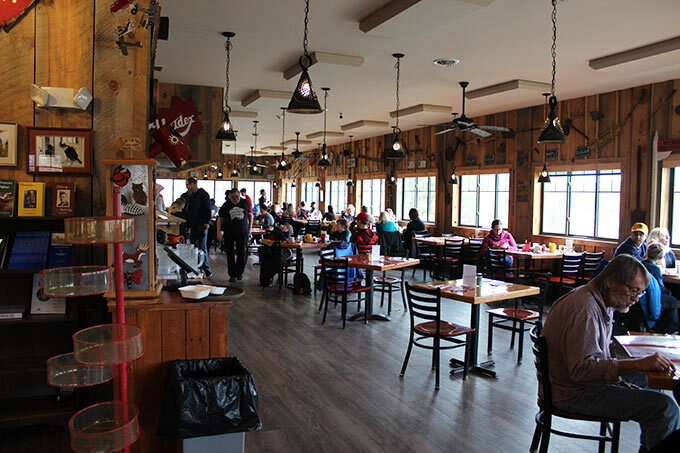 Great food, real maple syrup/maple syrup products, and excellent customer service are top priority. Not to mention the view out the dining room windows! 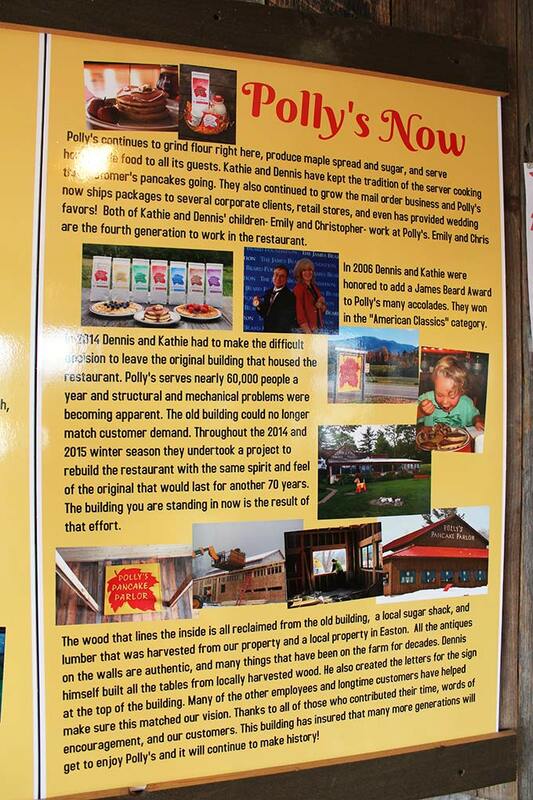 We’ve since visited twice more with the boys and had a great experience each time. If you remember nothing else, please note that you can call ahead to Polly’s and get your name on the waiting list. That’s a very good idea if you’re planning a visit. We went during the Christmas holidays and took the boys on our way up to Quebec City. 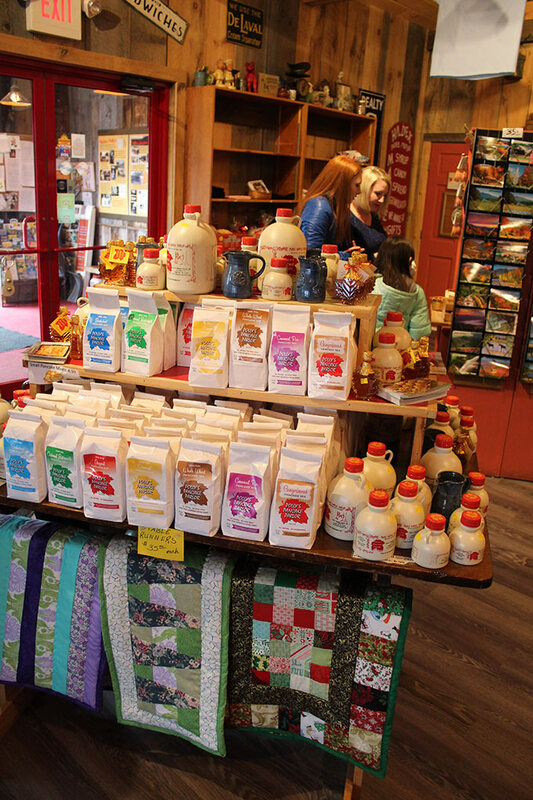 Shop all kinds of homemade mixes and maple products while you wait. 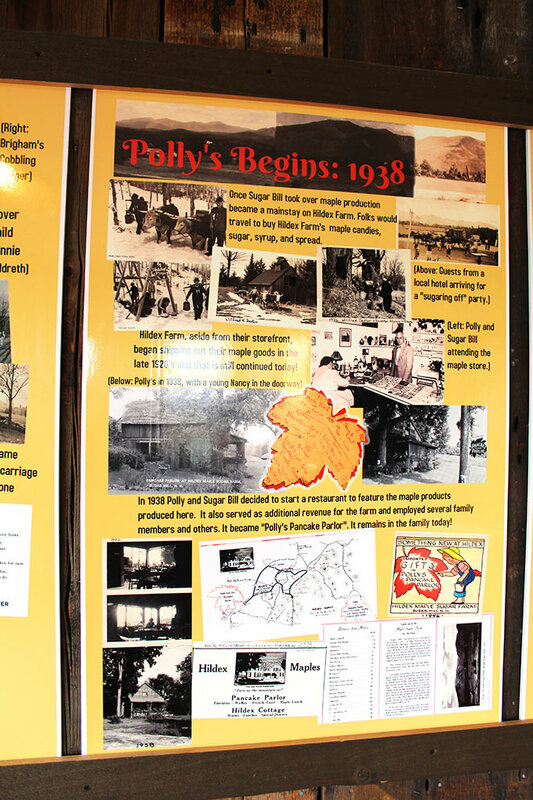 We called Polly’s when we left the house and still waited twenty minutes after arriving. And we’re an hour and a half away! So do call ahead, especially during busy holiday times. Some of you know our special little guy Hudson. He’s got Downs and autism, but that didn’t dampen his enthusiasm for delicious homemade pancakes a bit. So here’s the squeeze on Polly’s. There are different kinds of homemade pancake batter to choose from. Oatmeal buttermilk. Plain. Buckwheat. Corn meal. Gingerbread. And then there are the add-ins: walnuts and coconut. And your server works behind the long griddles, flipping your flapjacks! And when you finish your first custom stack of three, your server magically reappears with the second. That’s how they do it at Polly’s. And I didn’t hear anyone complaining. Check out their extensive menu here. 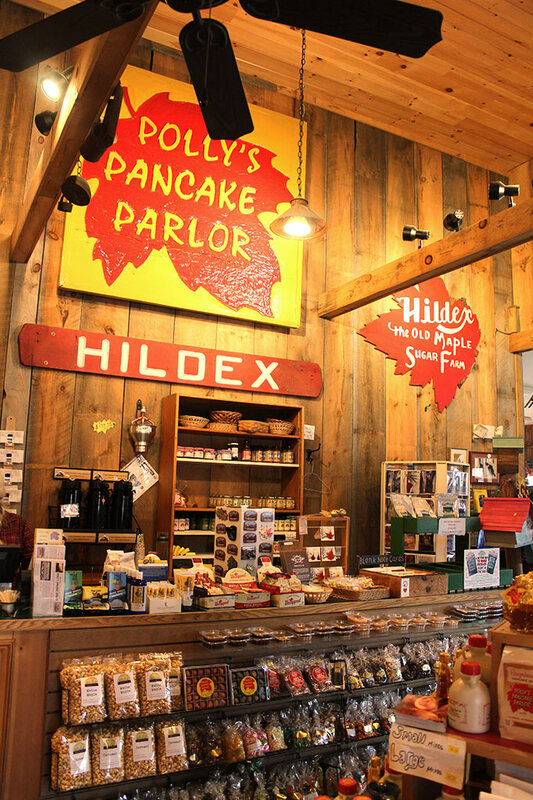 Originally Hildex Farm in Sugar Hill, Polly’s Pancake Parlor started in 1938. Polly’s mills their own flours. And in 2006, they received a James Beard Award in the “American Classics” category. 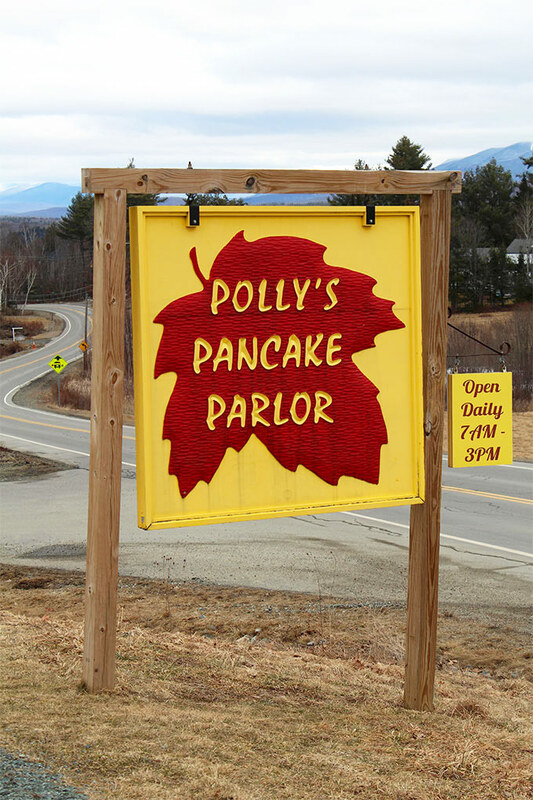 So if you’ve never been to Polly’s Pancake Parlor, add it to your New England bucket list. You won’t be disappointed. We left Polly’s and headed to the Garnet Hill Outlet, just a hop, skip and a jump away. 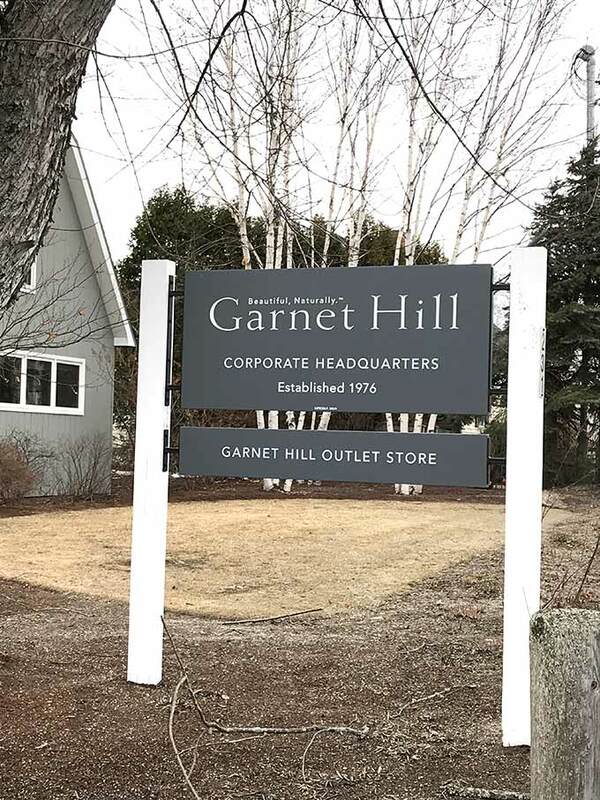 If you’re not familiar with Garnet Hill, it’s primarily a women’s clothing company known for natural fibers, linen, fabulous wools and cashmere. They also carry the exclusive Eileen Fisher brand. I didn’t buy anything there, but that’s not the end of the story. 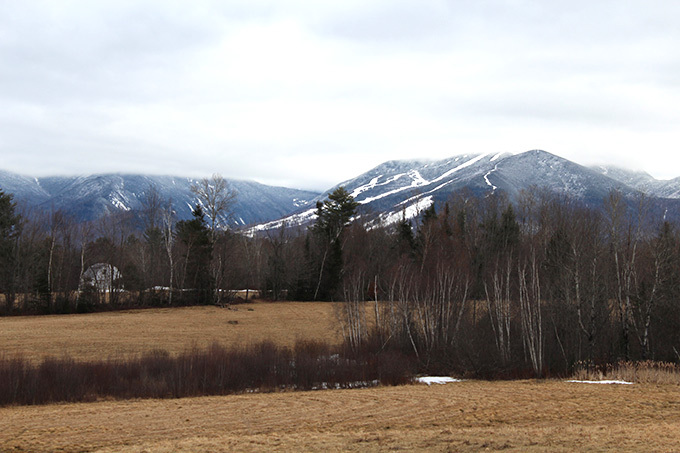 We headed on to Chutter’s in Littleton, NH, not far away. 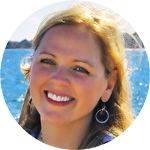 While Jon and the kids shopped at the longest continuous candy counter in the world, I slipped in to the shop next door – Emma & Co. Consignment. 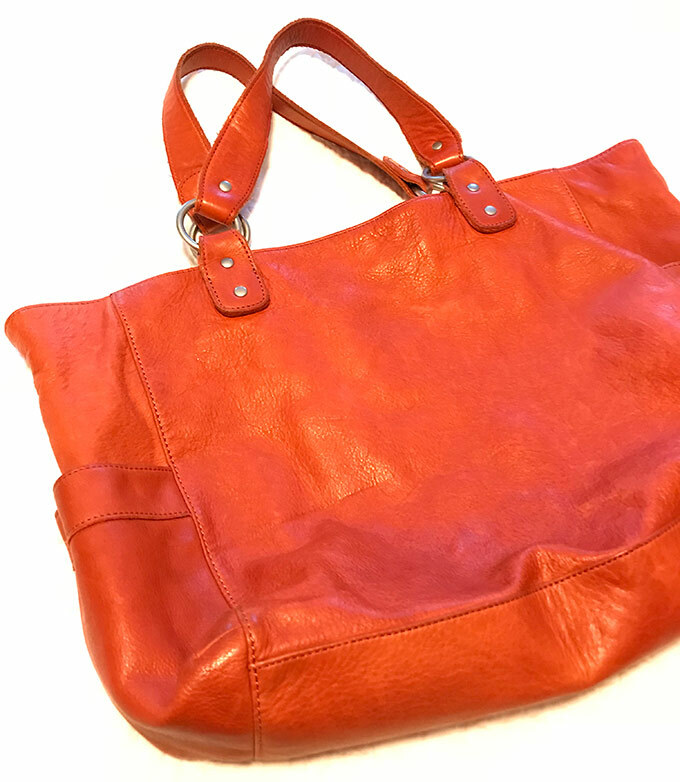 And scored this beautiful Garnet Hill leather bag for a song. Patience is a virtue! 🙂 The girl who checked me out said they carry lots of Garnet Hill because the outlet is so close. And quick kitchen update – it’s functional! Kitchen sink, stovetop and oven happened this week. Now it’s just the details. I’ll keep you posted. Have a beautiful, relaxing weekend and hope it includes a short stack with real maple syrup! Believe it or not, just before reading your post I made pancakes with real maple syrup (it is that time of year here in Michigan) for the family on this Saturday morning. Love you, Allie, enjoy your weekend! Hi Allie! I love your post today. I am the biggest maple syrup fan there can be, too. It is like you know my soul. I live for these things! Pancakes are right up there on my favourite things list forever- and homemade ones, or in store made are definitely the way to go. Polly's sounds like the sort of place I would absolutely be so excited to see. It has wonderful history and it would be worth every penny, and the time it takes to get there, too. I really am not so far away from you so hopefully soon I get to go and visit all around there. I want to go to Massachusetts and New Hampshire and all that I could pack in, so it is really a priority and I look forward to the day when I can say I am going there.Hoping for this fall, but work might prevent that so I am not positive about this yet, just really hopeful! Maybe you will be able to give me some advice on places to see when I am ready to start planning this trip? I love that bag you got, you really do know how to get my attention. My husband is always kidding about having to build a new place to house my new clothes and bags. It is so nice to get something beautiful and that colour you got is just amazing. I love it. I am glad your kitchen is coming along, too. These things take a bit of patience, but take your time and make sure it is right. That way you won't be wishing you had done something else. I am bad for that, and it seems like I am forever wanting to change and update things as it is.I really need to win a lottery to keep up with my thoughts. So pleased this week. I finally got my beautiful kitchen aid mixer that I was trying to deny myself for the longest time. I kept saying they are just so expensive and take up so much room, hand mixer works fine,etc, etc. I need to make something fabulous now and need some free time, too. Maybe you will have a great idea for me. So I hope your weekend is filled with great things! Hopefully you are able to get out someplace wonderful again soon! Gingerbread pancakes, please!! This place looks and sounds awesome--I can see why Hudson enjoys it so much. And your bag is beautiful. Oh, how I love a great deal. What a fun field trip for everyone! Can't wait to see pictures of your "after"!! Yep. Had pancakes with real maple syrup with the niece and nephew just a bit ago. Have had real maple syrup ever since John joined the family and was like “what is this...it’s not real maple syrup syrup”. Haha! Who doesn't love pancakes? And Aunt Polly's sounds like the best place ever! Thanks for introducing us to that place! What a fun post!! I’ll go with you to Polly’s one of these days! You know I love maple too! It really sounds like a gem. A gem with history, how fun. I love the pic of Hudson in all his glory!! That consignment shop sounds fabulous!! Let’s GO!! Hi Puja! Thank you. Yes, you would love Polly's Pancakes. Everything they make is extra delicious and it's the real maple syrup that's the biggest treat. In fact, when I was in Romania this past summer we brought some maple syrup along and shared it with our friends. They had never tried it before and they loved it.